Have you enjoyed the professional services provided by Azura Skin Care Center? We’d love for you to leave us a review on Facebook, Yelp, or Google! *”Beautiful atmosphere, friendly and knowledgeable staff. I wouldn’t trust anyone else with my face! Jennie has treated my whole family with fabulous results.” – Marsi C.
*”I had thee best massage of my life! My therapist did an excellent job! I definitely will be back! 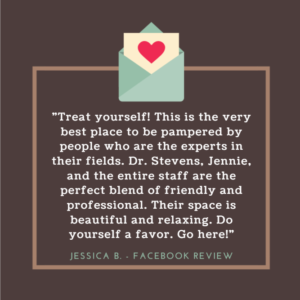 I can’t wait!” – Teri D.
*”The most professional staff and such and aesthetically soothing atmosphere!” – Lori M.
*”I had a massage on Friday and it was one of my favorites so far (and I’ve had plenty). Michelle was amazing! Azura is so beautiful and peaceful, it made for a relaxing experience. The Staff is warm and friendly. 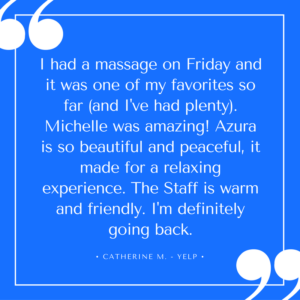 I’m definitely going back.” – Catherine M.
*”Azura Skin Care Center is amazing! The staff is very warm, friendly and extremely knowledgeable….and most importantly, they care about their clients. I’ve been a long term client of Jennie’s and I’ll never go anywhere else. If you’re looking for good skin care advice and services, go to Azura. You will not be disappointed. In fact, you won’t want to leave!” – Kathleen H.
*”This place is amazing. I am also a long term client of Jennie and will not go anywhere else for my skin care needs. The office is beautiful, they are very knowledgable, and they won’t try to sell you products or services you don’t need.” – Erin B. *”Had an amazing chemical peel from Hope today!! What an amazing staff and beautiful spa!!! Who doesn’t want to be pampered for an hour and walk out feeling beautiful. 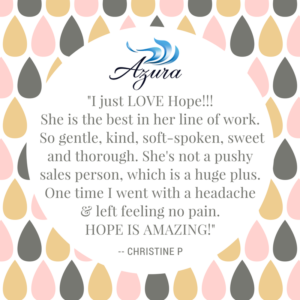 I will definitely be back.” – Chrystal P.
*”Hope gave me a FABULOUS acne treatment. I had very little discomfort during the process and no swelling afterwards. It is my second acne treatment there and it was a wonderful experience!” – Piper R.
*”Azura is an elegant environment where the staff helps you feel at ease and pampered. Jennie is the rockstar of esthetics and treats each patient individually – not as a “Barbie doll” cookie cutter approach. This leaves one feeling like their appearance is their personal best, and the most modern efforts are being employed to work together to keep skin at an optimum level. The staff is professional, yet friendly. Don’t hesitate to become a regular client OR if you see just passing through – stop in for a massage and individualized treat.” – Anne L.